If you haven't got time to hippity hop to the store, there are a number of beautiful Easter printables that you can print out right on your home computer using recycled paper (even at the last possible minute). 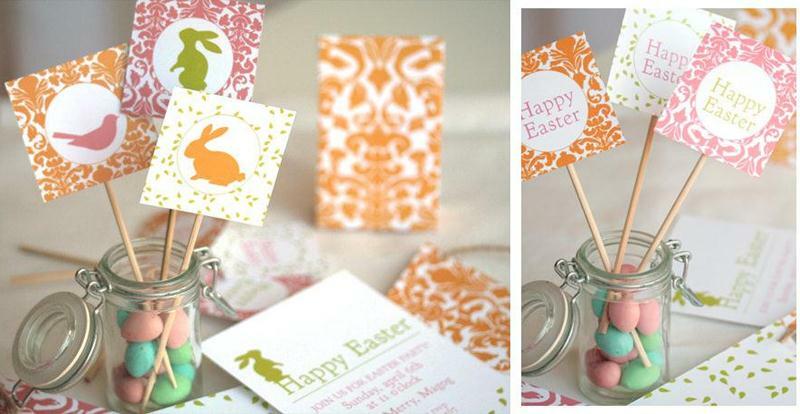 Take the printable Easter cupcake toppers and tags from La-fabrique-a-bricole shown above for example. Perks of printables include a lower price point and the ability to reuse them year after year. Many printables include customization features, making them useful for holidays, birthdays and other events alike. Keep reading to see more of our favorite must-have last minute Easter printables. This adorable 25 page PDF party kit includes everything you need quickly, for a wonderful Easter egg hunt. The set has templates for “fill in the blank” invitations for Easter Egg Hunt and/or Easter Party, envelopes, template, circle tags for cupcake toppers or decorating cups, banners, lawn flags, napkin rings, Easter baskets, coloring pages, plus some adorable bunny, chick, flowers, leaves and egg cutouts, and more. This set also comes with some cool bonus items – a collage sheet of Easter icons and place cards, placemats and an Easter card. 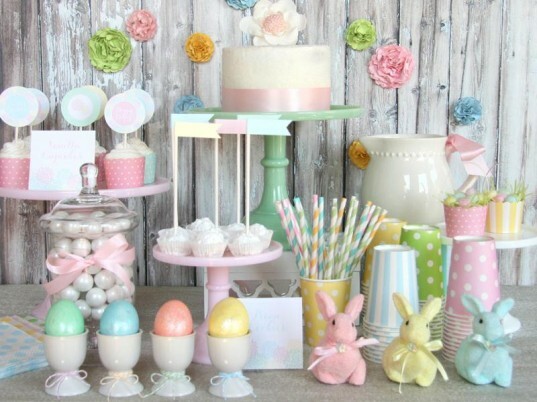 This gorgeous printable collection comes in lovely pastels and can help you decorate for an Easter party faster than fast. The full package comes with a menu and invitation, party circles, thank you tags, drink and food flags, fancy Easter labels, mini notecards and more. 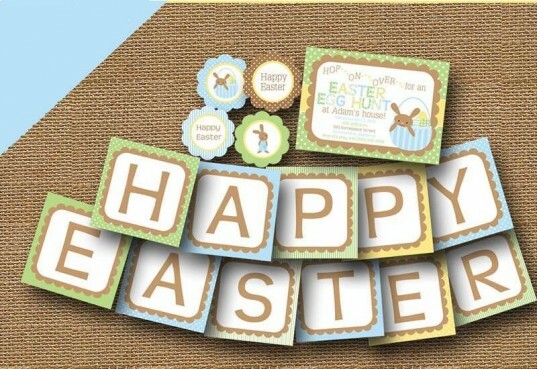 This Easter kit is a great way to only get the decor items you need. You pick and choose from all the available items and get only the three you need most, for a nice low price. Your choice of invitations, thank you cards, party tags, favor tags, menus, water bottle labels, welcome sign, treat bag toppers, banner and blank food tags. You can also go nuts and order the whole shebang. Seriously, what’s cuter than little bunnies in cars? 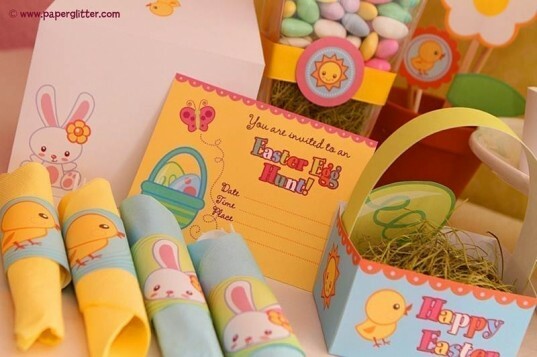 Your child will adore these printables, which come with Easter baskets, individual bunny cars with space for eggs, cupcake toppers, cupcake wrappers, tags and a sweet mini bunting. We love that Paper & Cake always manages to think of everything you need for a party, and their Easter party kit does not disappoint. This beautifully created pink and green pastel set includes Easter baskets, crayon boxes, cupcake picks, basket tags, mini-standees, cupcake wrappers, bag toppers, placemats, lawn picks, coloring page, pennant banner “Happy Easter,” wearable bunny ears and a full page of patterned paper. This sweet kit does double duty as Easter party or spring birthday party decor. 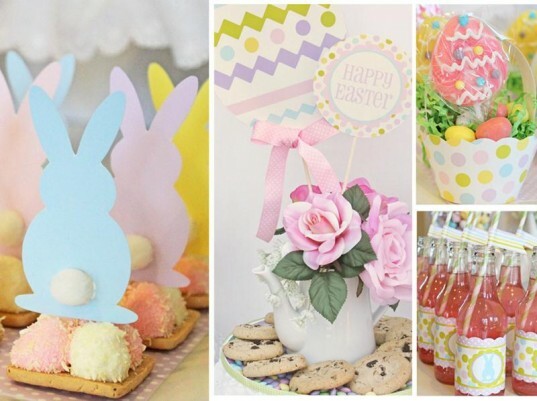 The whimsical set can be personalized and comes with party goodies galore, such as a full sheet of 3″ Easter egg cutouts, party circles in 3 designs: Bunny silhouette, Easter egg, and “Name is Age” (example: Lila is 1), centerpiece sign of an Easter egg, pastel polka dot cupcake wrappers, “Happy Birthday” banner with bunny silhouette end pieces in pink and white dot, birthday door sign, fill-in invitations, candy bar wraps, thank you notes and much more. This adorable 25 page pdf party kit includes everything you need quickly, for a wonderful Easter egg hunt. The set has templates for "fill in the blank" invitations for Easter Egg Hunt and/or Easter Party, envelopes, template, circle tags for cupcake toppers or decorating cups, banners, lawn flags, napkin rings, Easter baskets, coloring pages, plus some adorable bunny, chick, flowers, leaves and egg cutouts, and more. This set also comes with some cool bonus items - a collage sheet of Easter icons and place cards, placemats and an Easter card. Seriously, what's cuter than little bunnies in cars? 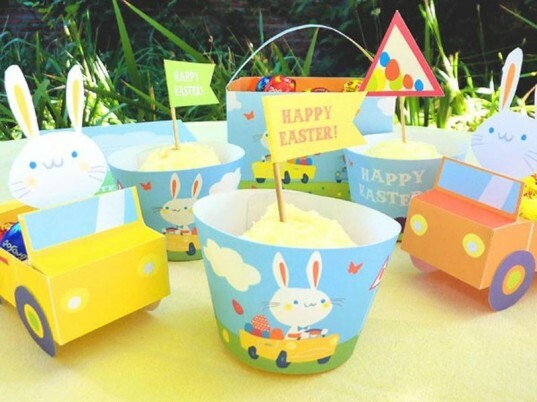 Your child will adore these printables, which come with Easter baskets, individual bunny cars with space for eggs, cupcake toppers, cupcake wrappers, tags and a sweet mini bunting. We love that Paper & Cake always manages to think of everything you need for a party, and their Easter party kit does not disappoint. 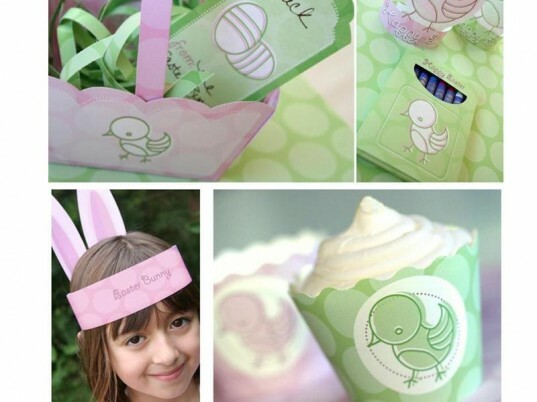 This beautifully created pink and green pastel set includes Easter baskets, crayon boxes, cupcake picks, basket tags, mini-standees, cupcake wrappers, bag toppers, placemats, lawn picks, coloring page, pennant banner "Happy Easter," wearable bunny ears and a full page of patterned paper. This sweet kit does double duty as Easter party or spring birthday party decor. The whimsical set can be personalized and comes with party goodies galore, such as a full sheet of 3" Easter egg cutouts, party circles in 3 designs: Bunny silhouette, Easter egg, and "Name is Age" (example: Lila is 1), centerpiece sign of an Easter egg, pastel polka dot cupcake wrappers, "Happy Birthday" banner with bunny silhouette end pieces in pink and white dot, birthday door sign, fill-in invitations, candy bar wraps, thank you notes and much more.